The foundation of any successful social media marketing campaign is the target audience. And this stretches much further than just social media. In fact, I’d go so far to say to say that knowing the target audience is crucial for any business. If you haven’t identified your target audience, you’ll crash and burn and get outrun by your competitors in a heartbeat. And really, it’s logical if you think about it. If you don’t know who your target audience, you’ll just end up aiming in the dark, and you will with almost full certainty miss. And as a result, waste your resources, time, and effort. The foundation of all successful social media campaigns is the target audience. 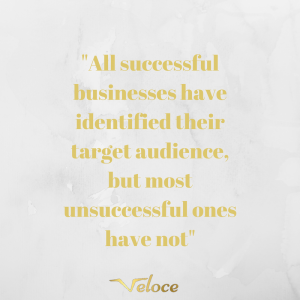 All successful brands on social media have clearly identified and defined their target audience, but most unsuccessful ones haven’t. There’s no denying that having identified the target audience is the first step to social media success, and marketing success in general, but unfortunately, many brands struggle, not knowing how to identify their target audience on social media. When you’ve identified your target audience on social media, you will better be able to spend your efforts where they are best spent, and invest in the things that you know will help you reach the people you know are most likely to become customers of yours. 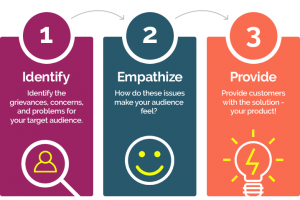 Moreover, having defined your target audience allows you to create the right type of content that your audience will actually find relevant and interesting – and you’ll be able to craft messages that sparks their interest. You’ve created an amazing product that you are super happy about. It is the market’s best product, and you’re able to have the market’s best prices because of a new way of manufacturing that you just came up with. Your product is a leash for dogs, and it is time for you to start selling it. You go to a local animal event and set up your stand. You wait and wait, but you don’t sell anything for hours. You lower your price, but still, people don’t seem to be interested. You look at the description of the event a second time and see that it is an event for cat owners, but since you haven’t identified your target audience, you don’t realize that you are targeting the wrong people. Unless you haven’t clearly defined the people who are most likely to buy your products and be interested in your business, any efforts of yours will be wasted. When you aren’t pitching your brand to appropriate customers, your efforts won’t have any impact. If you want to generate results worthwhile on social media, you need to target the right, appropriate customers, and you need to target them with a message that they care about. On social media, this means that you need to find out where they are, where they’re spending their time, and who they are. In this article, that’s exactly what I’ll teach you. I’ll go through how you can identify your target audience on social media step-by-step, so you can get the best results possible and avoid wasting your time, effort, and money. 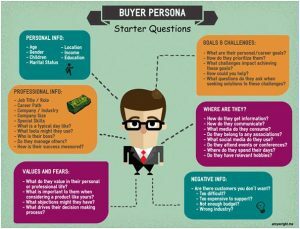 The first step to identifying your target audience on social media is to create buyer personas. The truth is probably that you have some kind of idea who your target audience is. No person is completely unaware of who might be interested in their products. For example, in my example of selling dog leashes at an event for cat owners, you probably realize that it isn’t the ultimate place to be, simply because the people who are there will be owners of cats, not dogs, thus having no need for your product. You might have a loose idea of your target audience, but you are probably struggling with defining exactly who the individuals who are going to buy from you are. In fact, identifying which people who are the target audience of a brand is actually quite challenging for marketers. And having a vague idea doesn’t cut it. It needs to be clear as ice because otherwise, you risk wasting your efforts and money for that matter. Age, location, gender, interest and more. Obviously, the more thorough and detailed you are, the better you’ll be able to target and appeal to your audience further on. Facebook has an extremely advanced ad manager that allows you to laser target your audience in order to reach the people who are most likely to buy from you and be interested in what you have to offer. The best part is that you can take advantage of Facebook ads when deciding on your target audience. 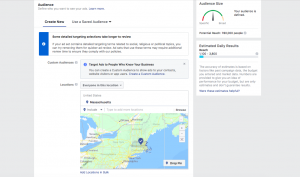 Once you’ve defined your target audience based on the criteria mentioned above, you can go to Facebook Ads and fill in all of those criteria in the ad manager. Based on your criteria, you can get an estimate, an idea of how many people who match your criteria. That way, you’ll get an understanding of the size of your potential target audience. If it’s too broad, you might want to narrow it down and be more specific, and if it’s too small, you might want to expand your target audience so your business idea is actually possible of proceeding with because there are potential customers. Now obviously, you want to have in mind that not everyone is on Facebook, so, therefore, you should take this number with a pinch of salt. However, a recent study found that close to 60% of Americans are on Facebook, which means that the number probably isn’t completely off, and holds some kind of numbers that in some way reflects the reality. This also means that you have some people you can survey to better understand what people it is that becomes customers of yours. What made the people who became customers of yours, customers? There are several tools you can send out to survey your audience, such as Google Forms or SurveyMonkey, however, you can also do it through traditional email or phone call. It’s completely up to you! What you want to do when surveying your existing customers is ask them where they are spending their time on social media, and what they like to do. That way, you can identify the preferred places of your target audience on social media. As a result, you can focus more on the platforms where the majority of your audience are, and less on the platforms which you thought your target audience was using but found out wasn’t. Which are your favorite social platforms? Which people do you go to for advice within the (your industry) industry? Which people do you look up to within the (your industry) space? Do you follow any influencers on social media? If so, which? One of my favorite methods of identifying people from my target audience is searching for hashtags across the various social media platforms. And since Instagram is my preferred social media platform, and it is also the platform that’s most supportive of hashtags, that’s usually the one I opt for. The reason why I love hashtags is they make it so easy! You just search for a keyword related to your niche, tap search, and then you’re presented with lots of posts shared by people who have an interest in your industry, which also means that most likely are potential customers of yours. Let’s say you are selling tennis equipment. That would mean that you’re in the tennis industry. Then, it’s just time to think of keywords that your target audience, the people who are interested in tennis use. The best part about searching for hashtags on Instagram is that they will present a section of “suggested hashtags” that are relevant to the hashtag you just search for, which will give you ideas on hashtags that your audience might be using. The same principle can be used for locations. Not only on Instagram but across the majority of social platforms. What you do is search for a location/event that is related to your industry on the platform you’re using. 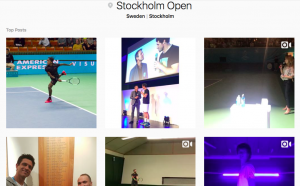 Let’s say that the Tennis competition Stockholm Open is in progress. I can assume that the people who are there are interested in tennis, and thus also my potential target audience, right? Twitter is a tremendously helpful platform when it comes to identifying your target audience because it allows you to search for keywords that haven’t been marked with hashtags. “I just visited the local market and found tennis equipment” I love tennis! And someone searches for the term “tennis” on Twitter, they’ll be able to find my tweet with the two terms “tennis” marked. If they would have a different target audience, they wouldn’t be your competitors, because after all, you’re competing and fighting with them for the same audience. It means that your competitors probably have customers who aren’t customers of yours and that you probably have customers that aren’t customers of theirs. It also means that with clever strategies, you can identify and steal your competitors’ customers. Start by looking at the social media platforms that your competitors are using. And preferably, you should look at the major competitors in your industry, because these are the ones that have the most experience with their audience and where they spend their time. By looking at the platforms they are using – and not using, you can get a better understanding of where your target audience is to be found. 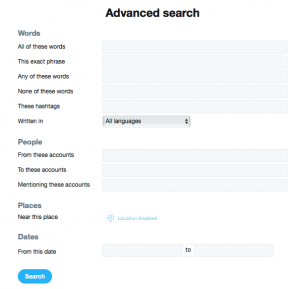 If none of your top three competitors are using Twitter, for example, it might be an indication that your target audience isn’t to be found there. Do some research about Twitter and look at the demographics of their users. Once you’ve done so, you probably have a good idea if you should or shouldn’t use that platform. When looking at your competitors, you also want to take note of which social media platforms they are most active on. You can guess that the ones they are most active on are the platforms that are most beneficial for them. When you’ve developed your customer persona, you can start sharing content that you think will interest your audience, and that will appeal to them. The thing is that when you put out a box of cheese in the woods, those that are most likely to eat it are rats and mice, right? And what if you have a bottle of soda in the sun? You’ll obviously attract bees! The same principle should be applied to the content you share. It’s all about having a value proposition to your target audience. If you share content that is valuable to your target audience, then obviously, the majority of people that you’ll attract will be people that fall into the category of your target audience. And that’s obviously a good thing! You’d rather have a following of people who are truly interested in the content you share instead than having a large and uninterested following. The same principle as sharing content can be applied to a giveaway. When you have a value proposition that appeals to your target audience, then obviously you’ll attract people from your target audience. Let’s say that you arrange a giveaway where you give away hundred thousand in cash. Yes, you’ll undoubtedly attract tons of contestants, but what is the whole reason for your giveaway? It might be one of the mentioned above, but let’s not forget that the end goal of all businesses is to sell more. It means that when you arrange a giveaway and give away a price that is so good that everyone joins it, it might look good on the surface with incredible statistics on how many that joined, liked the post, tagged their friends etc. but what you don’t pay attention to is who those people are. Sure, you might have attracted 500 thousand new people to your page, but how many of those actually fall into the category of being your target audience? Not a lot, is my guess. My suggestion is that you instead give away a niche-related price which only will appeal to your target audience. For example, if I give away a hockey stick, I can be fairly certain that the people who join my contest are interested in hockey. Why? Because for most other people, a hockey stick doesn’t have any value to them. Sure, some people might join in the hopes of winning and then be able to sell it, however, the vast majority of contestants with niche-relate prices that appeal to your target audience will mostly appeal your target audience. Finding your target audience is essential for business success. Social media offers an array of ways you can find your target audience, both for targeting them using the platform but also for learning where your audience spends time, and how you can better reach them in your marketing.